AT&T on Monday announced Digital Life, a home automation system that will enable you to control your home via the Web or a mobile app. The service is not yet ready for prime time, as the first trials are scheduled to begin in Atlanta and Dallas this summer, but you will be able to use AT&T Digital Life no mater your current wireless provider. AT&T said its home automation system can control cameras, windows, doors, various sensors (carbon monoxide, motion and glass break), individual thermostats in various rooms, door locks, and moisture detectors. Digital Life can also detect water leaks and turn off appliances, such as your water supply in case of a leak. All these sensors and devices connect to your broadband network (regardless of provider) and you will be able to control them via mobile apps for iOS and Android using a cellular network or from any PC via a browser. AT&T will also monitor activity from its 24/7 monitoring centers, and the company says it will handle installation of the platform in your house too. 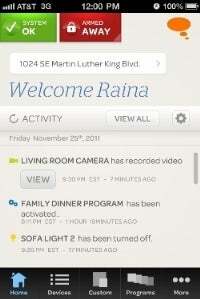 AT&T didn’t say how much Digital Life home automation system will cost. The company did say you will be able to customize the solution to your needs, so you can pick which home automation systems and sensors you want, and then you will be able to test them and buy them from AT&T stores. Verizon is already offering a similar system to AT&T’s Digital Life. It’s called the Home Monitoring and Control package and is priced starting at $10 monthly, but it requires Verizon broadband. Similar to Digital Life, Verizon’s solution supports cameras and monitors door locks, lights, door and window sensors, thermostats, and appliance switches. To give you an idea on pricing, an automated deadbolt keypad lock or an outdoor camera with Verizon costs $160; light control modules, $40; door and windows sensors, also $40; thermostats, $130; and appliance switches, $40.